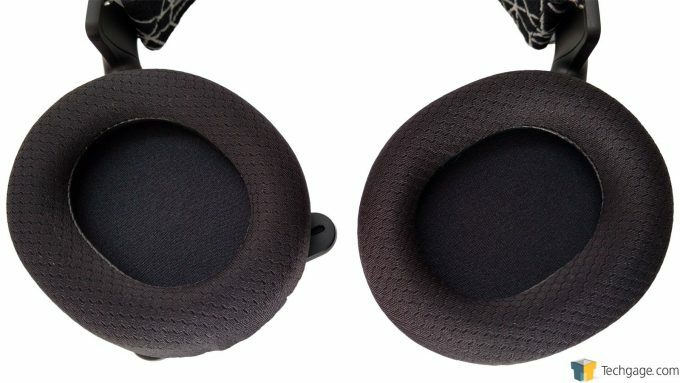 After 2 years we’re back looking at another headset from SteelSeries. Where the last one occupied the premium end of the scale with a price tag to match, the new Arctis series is set to take aim at the mainstream market, but retain the premium features. Read on to see how the Arctis 5 stacks up. To gamers, a headset is just as essential as any other component in their rig. 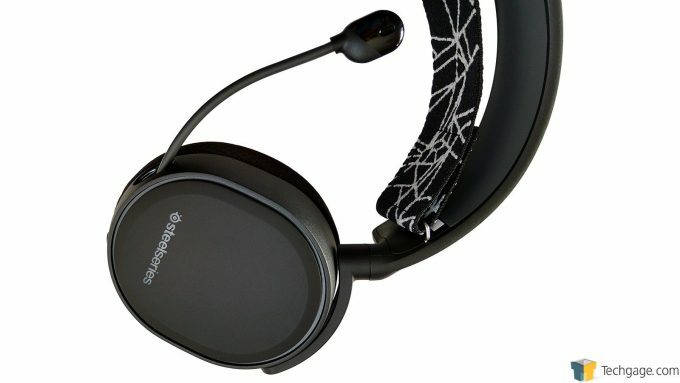 Not only does it need to have excellent sound reproduction so that they can hear every missed bullet or footstep, and a quality microphone with which to coordinate strategies and trash talk n00bs, but it also needs to be customizable to their exacting preferences, lightweight and comfortable for long gaming sessions. 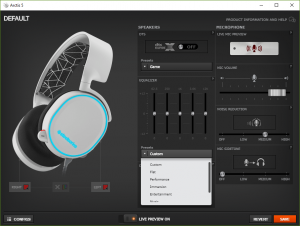 Unfortunately, many manufacturers charge an arm and a leg for a quality gaming headset that covers all of these bases, but thankfully this appears to be changing with the release of SteelSeries’ Arctis headset lineup. Not only will users now get to keep all of their appendages, but they’ll also score a quality headset at a reasonable price point. The Arctis family of headsets are available in black or white, and are compatible with PCs, consoles, and mobile devices. There’s the Arctis 3 that covers the essential needs of gamers, the Arctis 5 that we’re looking at today, which sports RGB illumination and a small number of additional features, and the Arctis 7 that features most of what the 3 and 5 models do, as well as the added convenience of wireless connectivity, and a few other bells and whistles. We’ll start this headset hootenany with a look the cups that feature a fair degree of swivel so that they’ll lay pads down when the headset is worn around the neck. On the Arctis 5, these ear pieces feature RGB LED accents on the outside, while on the inside is a ring of what SteelSeries calls AirWeave padding to keep your ears comfy and cool. 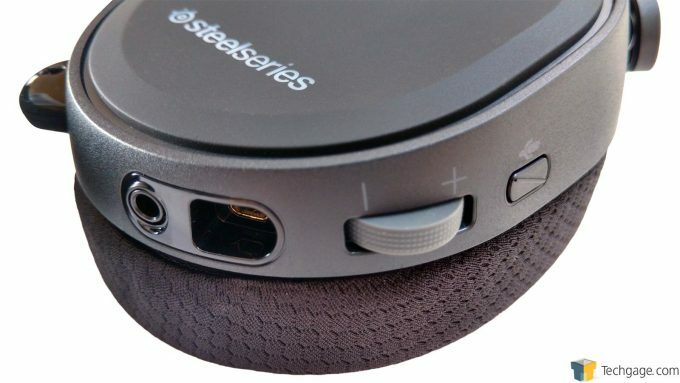 Under the inner lining are the DTS Headphone: X 7.1 surround sound-capable SP1 drivers, which SteelSeries claims use the same 40mm neodymium drivers used in its premium headsets. On ear controls for the Arctis 5 are made up of a mute button for the microphone, and a volume dial. 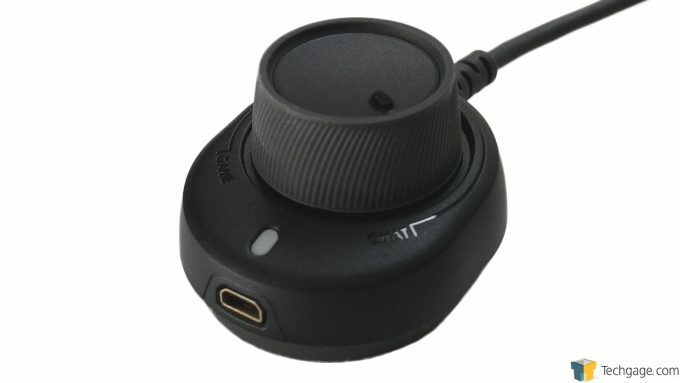 These are placed on the lower rear edge of the left cup, behind the port used to connect the headset to the ChatMix control dial, which sits just back from the 3.5mm audio share port. The retractable boom microphone stays stored in the left cup and simply pulls out when needed. The boom itself is flexible, while the end features a bi-directional, “Clearcast” noise-cancelling mic, with an illuminated top section that glows red when the mic is muted. SteelSeries claims to have gone back to the drawing board when designing this mic so that it provides out-of-this-world voice capture quality. 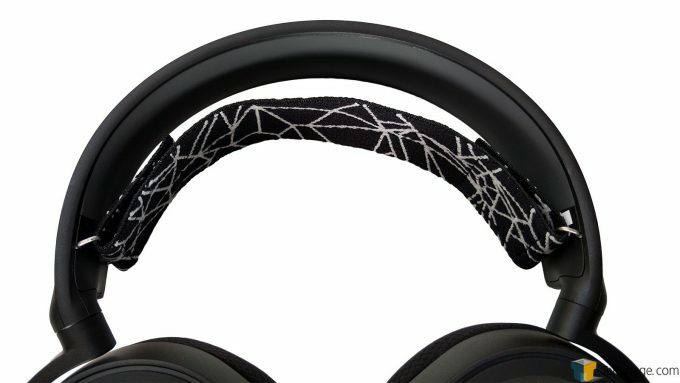 All of the Arctis headsets allow for some customization in the form of the headband wrap. Like the lowest price model, the Arctis 5 features a half wrap suspension headband that secures to the headset through two metal loops with Velcro. 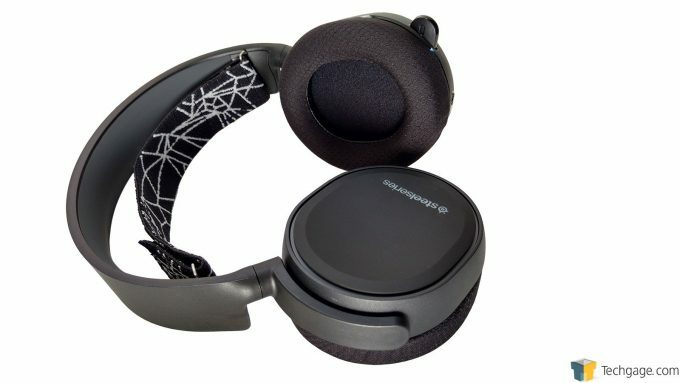 It ships with a band that features a white geometric pattern, but SteelSeries already has different designs available for sale in its store. Six feet out from the end of the USB cable sits the ChatMix control dial. This small, white LED-lit dial changes the blend of in-game sounds and music, and incoming voice chat to ensure that one doesn’t drown out the other. The rubber ring on the underside protects the surface it rests on, as well as providing a small amount of resistance to slipping and sliding. Changes to the microphone, such as noise-cancelling and volume, are also saved here or to the cloud so that they can be loaded later on. 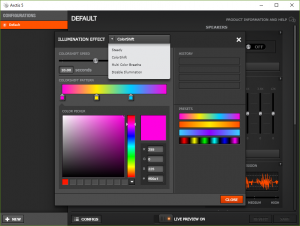 The screenshots below show some of the lighting settings, as well as some of the EQ presets that are available. 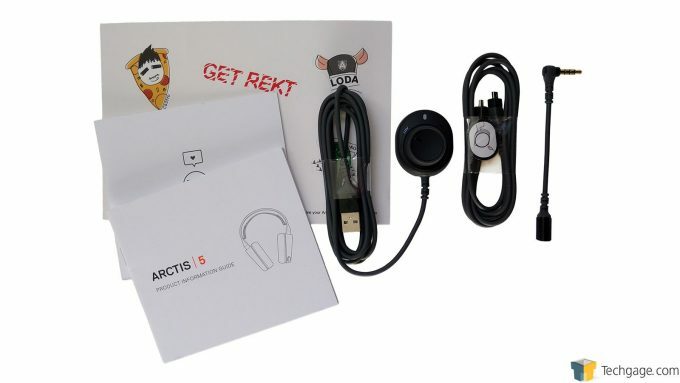 Included with the Arctis 5 is a rather odd assortment of stickers, a card with some links to SteelSeries’ social media accounts and the URL for support, a product information and user guide, the ChatMix dial, the extension cable that runs from the dial to the headset, and finally a 3.5mm 4-pole connector that allows the Arctis headsets to be used with consoles or mobile devices.